Maps Can be found on each of the Branch Pages. These maps link place names mentioned in the text to locations. The material below is largely a compilation of the work of Dr. Franklin Kidd. Kidd Family in Ireland and Scotland. a Canadian branch of the Corbally side of the family in the 1970's, met Franklin Kidd at Leighlinbridge and became friends with him. The following includes a copy of the unpublished book that Franklin Kidd wrote between 1971 and 1974 and which he kindly shared with dad. -The original document by Franklin can be accessed in each of the sections/branches. -Additions and appendices are keyed to it. -Franklin's Charts have been converted to PDF by William Kidd (below) and are included with each of the Chapters involved. -At the beginning of each chapter is a tree type chart to help in the understanding of the material. William Kidd of Albany NY USA has done a lot of work in converting the original document into these formats and the tree type charts. He has also created a very detailed map to show the locations mentioned in the text. See link on the "Branches" Page above. Information about the Potato Famine is found on The Limerick Page. (click to go there) Dr.Joseph Kidd,of the Limerick Branch, worked with the poor who were victims of the famine. Contemporary newspaper descriptions are included that tell of this awful event. Dr. Kidd later went on to become important medical doctor in London and the doctor of Prime Minister Disraeli. that came from the Settle region of Yorkshire in England in the 1500's. 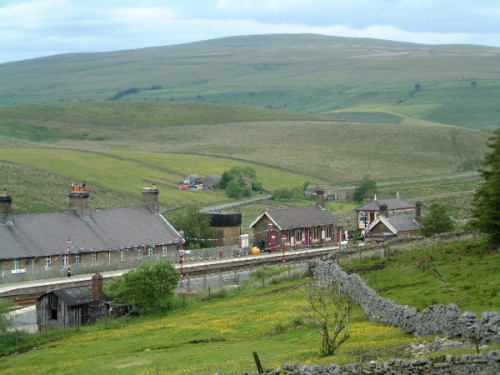 (see picture of the Settle area below)One branch of the family emigrated to south Ireland and one to Scotland. At a later time the Scottish Kidds also emigrated to Northern Ireland. - We have been interested in the Bax Papers for some time. Alfred Bax was an antiquarian and genealogist who lived in the late 1800’s. He had traced the Kidd family from Settle (York) through to his family in Surrey England. It was this material that Franklin Kidd referred to in his search for the beginnings of the Kidds who went to Ireland. The relevant sections of Bernard Thistlethwaite’s book about the Bax family are enclosed. Thanks to Peter Kidd for his help with this material. - We have been sent... a mysterious English Tree...can you help to identify it? William Kidd (see above) met with Wendy Kidd in Wales in 2012 and again this summer 2013. 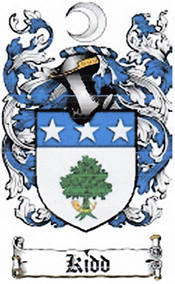 Wendy is Franklin Kidd's niece by marriage and she generously provided him with a previously unpublished document by Franklin about the Kidds of North Ireland, Scotland and the Coat of Arms. There have been considerable additions to the Coat of Arms material. The complete document can be seen in an OCR version can be seen here. The references below refer to this document. The movement of The North Ireland Kidds to New Zealand contributed by Graham Kidd. This includes a history of The Kidds in North Ireland and the family in New Zealand presented at a 2009 Family Reunion and Grahams's talk at the time. that your information has been reliably researched. The information in the section called "Help in Getting Started" will hopefully point you in the right direction as well. The movement of people in succeeding generations will complicate this search considerably. Appendices to the Branches are found at the top of the pages or are indicated at the right side of the text in red and provide links to additional family information that has been supplied by researchers from around the world. These appendices represent valuable additions and extend the work of Franklin Kidd to make this site even more valuable. Your contributions to these appendices would really be appreciated.